Love the Alexis Mirror from Mindy Browne Interiors! Ornate in style, suited for period style homes or to achieve that era of Georgian or Edwardian décor. Gold/Silver finish. Please note special orders can take up to 2 weeks -Terms & Conditions Apply. Make a statement with the wonderful Adena Upholstered Bed Frame with its stunning shape with large deep cushioned winged style headboard with silver beads and buttons and elegant stitching. The frame has a low modern rectangular foot board and also features extra wide side rails. This stunning bed is available in 3', 4', 4'6, 5' & 6'. The frame is made from solid hardwood and deep cushioned and finished by hand in a soft smooth soft woven fabric. The frame is double bolted and has ventilated board style base for a great support to your mattress, as well as being extra solid and secure. Available in over 50 different colours with a choice of castor or wooden legs in dark or light as well as diamante or fabric buttons. We also have a wide range of styles and headboards available to order from catalog. If you would like to see our alternative colour options please call in store to view our swatches. Please note special orders can take up to 6-8 weeks – Terms & Conditions Apply. Make a statement with the wonderful Jaclyn Upholstered Bed Frame with its stunning shape with curved deep cushioned headboard with tufted diamante and elegant stitching. The frame has a curved foot board and stunning caster feet. This bed is available in 3', 4', 4'6, 5' & 6'. The frame is made from solid hardwood and deep cushioned and finished by hand in a soft smooth soft velvet style fabric. 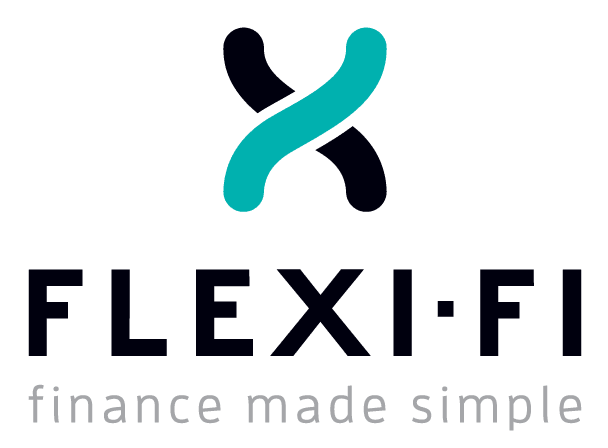 The frame is double bolted and has ventilated board style base for a great support to your mattress, as well as being extra solid and secure. Available in over 50 different colours with a choice of castor or wooden legs in dark or light as well as diamante or fabric buttons. We also have a wide range of styles and headboards available to order from catalog. If you would like to see our alternative colour options please call in store to view our swatches. Please note special orders can take up to 6-8 weeks – Terms & Conditions Apply. With a contemporary twist to a traditional design, Marissa is a beautifully crafted range with bold, contrasting bespoke silver handles. Design features such as gently bowed fronts, classical corniced tops and turned legs demonstrate attention to detail, whereas practical Blum soft-closing drawer runners, high quality hardware and a durable protective finish all attest to the quality of this elegant range - granting Marissa bedroom as updated classic suited to both modern and traditional settings. 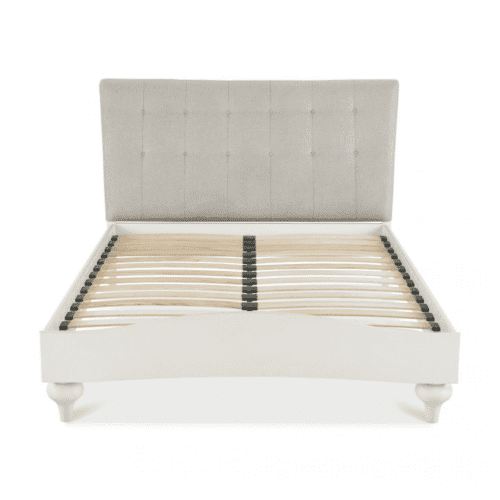 The Marissa Bed is available to order in Soft Grey or Urban Grey in a 4'6 or 5' Size with Pebble Grey Fabric Headboard with a Vertical Stitch or as a Oak & Antique White or Soft Grey in a 4'6 or 5' Size with Pebble Grey Fabric Headboard with a Diamond Stitch. Make your room complete by adding - Bed, Tall or Wide Chest, Dressing Table, Vanity Mirror, Stool, Night Stand, Double or Triple Wardrobe. Also available as Dining & Occasional Range. Please note special orders can take up to 6 weeks -Terms & Conditions Apply. The Chanel White bedroom collection is crafted from white painted American poplar solids and veneers and offers a contemporary update to classic French styling. Chanel effortlessly combines a bold character with subtle attention to detail that results in a range that is, quite simply, beautiful. Intricate details such as a curved crest rail on the bed and bespoke shield handles contribute to the beauty of this range, while surprising features such as hidden drawers and soft-closing runners allow for a superior user experience. Chanel is an exquisitely grand range that will add an opulent touch to any bedroom. The Chanel White Bed is available to order in 4'6, 5' & 6'. This range is available to order as a Bed, Nightstand, Chest, Wardrobe, Mirror, Dressing Table and Stool. Please note special orders can take up to 6 weeks -Terms & Conditions Apply. Make a statement with the wonderful Larissa Upholstered Velvet Bed Frame with its a gorgeous chesterfield sleigh design with a extra high headboard and matching footboard. All finished in a soft velvet glitz soft velvet fabric that can be blinged up with the crystal buttons as well as delicate bronze beading along the scrolls of frame.The frame is finished with solid hard wood feet. This bed is available in 3', 4', 4'6, 5' & 6'. The Larissa frame is made from a solid hardwood and covered in a glitz soft velvet fabric that has a ultra soft feel fabric for a smooth soft finish.The frame is double bolted and has a ventilated board style base system for a great support to your mattress and maximum support strength. Available in over 50 different colours with a choice of castor or wooden legs in dark or light as well as diamante or fabric buttons. We also have a wide range of styles and headboards available to order from catalog. If you would like to see our alternative colour options please call in store to view our swatches. Please note special orders can take up to 6-8 weeks – Terms & Conditions Apply. The Crushed Velvet Double Roll Top Bed Frame in Silver is a gorgeous modern luxurious will bring glamour into your bedroom. Upholstered in a sumptious silver crushed velvet with sleigh bed rolled headboard and footboard and wenge leg available in 4'6, 5' & 6'. Please note special orders can take up to 16 weeks -Terms & Conditions Apply. The Sandy Bed is casual design can fit tightly into any bedroom size and comes with a high headboard, low foot end and metal mesh base. Available to order in 3', 4' & 4'6 and in Beech, White or Two Tone. It is also available in light grey in 3' or 4'6 sizes only. We offer an assembly service for €50 - please ask in the comments when ordering or call us on 064 669 1112. Please note special orders can take up to 2-3 weeks – Terms & Conditions Apply. The George 3' Bed is an elegant design with solid wooden slats perfect for any childs room. The George is available in 4'6 & 3' in Cream. Please note special orders can take up to 2-3 weeks – Terms & Conditions Apply. The Elaisa Metal Bed brings a classic touch to your bedrooms decor. This timeless design has a curved frame and classical design. The Elaisa is available in 4', 4'6 & 5' in Cream (4', 4'6 & 5'), Grey (4' & 4'6 only) & Black (4'6 only). Please note special orders can take up to 2-3 weeks – Terms & Conditions Apply. 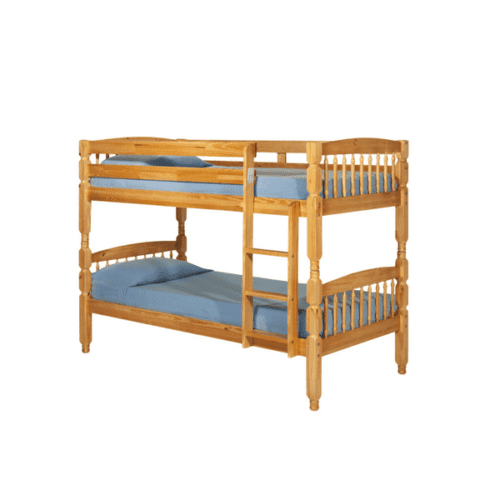 The Alpine pine bunk bed is a perfect children and teens bunk bed made from solid pine and is strong and durable fitted with a fixed ladder. It is available to order in Honey or White. The Alpine also separates into two single beds - ideal for when children get a little older, or acquire more space. This classic bunk bed will make a wonderful addition to any bedroom. Bed frame only. Mattresses and bedding not included. We offer an assembly service for €50 - please ask in the comments when ordering or call us on 064 669 1112. The Andy Twin/Single Bunk Bed is a perfect for a sleep over with space for two in the lower bunk and one on top. The clean lines and fresh design of this bed mean it looks great in any contemporary bedroom. This bunk is available to order in a choice of silver, black or white finish. Bed frame only. Mattresses and bedding not included. We offer an assembly service for €50 - please ask in the comments when ordering or call us on 064 669 1112. Please note special orders can take up to 2-3 weeks – Terms & Conditions Apply. The Moby 3' Bunk Bed is the perfect for the kids! With sleek and modern aesthetics finished in an aluminium colour which has a sturdy guard rail surrounding the top bunk for safety. The bunk can also be split into two separate beds. Available to order as a Silver, Black, Pink or White. Mattresses sold separately. We offer an assembly service for €50 - please ask in the comments when ordering or call us on 064 669 1112. Please note special orders can take up to 2-3 weeks – Terms & Conditions Apply. Love the Astoria Rectangle Wall Mirror with Glass and Floating Crystal Detail. This can also be ordered in square form. Please note special orders can take up to 6 weeks -Terms & Conditions Apply. 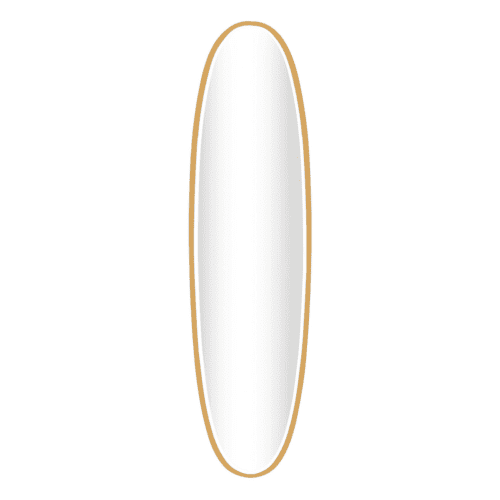 Love the Beaumont Wall Mirror available with either Gold or Silver trim. Please note special orders can take up to 6 weeks -Terms & Conditions Apply. Love the Blair Mirror from Mindy Browne Interiors! Sleek in design with a beveled edge. A very contemporary feel to this mirror. Please note special orders can take up to 2 weeks -Terms & Conditions Apply.